And now for some European content. Aside from Beckham and the World Cup, and if we don't count MLS as a viable option then most US-based soccer fans will answer this way: "UEFA Champions League." Nowhere else on Earth do so many multi-million dollar players and clubs go head to head against one another. MLB World Series, NFL Superbowl and NBA finals aside, this competition garners worldwide attention on a weekly basis and during the workweek... during the day (here on the flip side of the Prime Meridian). This, after all, is the world's game. And these, after all, are all the world's stars. A good majority of the planet is represented in one way or another with Brazil and Argentina taking up most of the teams (think of it like the US population and its energy consumption in relation to the rest of the world). Now, after a two month hiatus the UEFA Champions League is finally here and in single elimination, 16 team format. I don't pretend to be an expert and I aim to be objective, always. If this were my real job I would gladly put considerable more study towards it and maybe don a journalism major. Alas, I am only a scientist. But here's what's at stake: Coaches, players, fans, sponsors and the future of the game. The match-ups are legendary: Man U vs Inter, Roma-Arsenal, Real Madrid-Liverpool, Juventus-Chelsea. Other teams like Barcelona (Lyon), and Bayern Munich (Sporting Lisbon) are virtual shoe-ins as eternal favorites but upsets abound on this planet. What if Messi's Barca is knocked out? Who cares what happens with Villarreal and Panathinaikos or Atletico Madrid and Porto? Well, for one, some of these teams are prime locations for future (present) US national teamers, as is the case with Jozy Altidore (Villarreal albeit on loan to Xerez at the moment). And here's the other thing. Many coaches and teams are hanging tenuously by a thread.. Wenger isn't getting any better at his job with Arsenal (ESPN's Tommy Smyth made it blatantly open that he feels the Dutchman should leave the Gunners), Rafa Benitez has been quiet about his future with Liverpool, Guus Hiddink is an interim for Chelsea. On the other hand we have managers new to their teams but with distinct success. Such is the case with the "Special One" himself--Jose Mourinho and Spurs misfit Juande Ramos (now interestingly successful with Real). This season it's closer than you may imagine, although the favorites still gravitate amongst the top European leagues--England, Spain and Italy. Guardiola's Barcelona is nearly perfect and a better team than the champion in 2006 with Ronaldinho and Deco. Messi has made up for it and overflowed his talent banks so that the rest of the team is elevated closer to a higher deity (interestingly, Maradona sure likes Messi). Manchester United is nowhere near the team that won it all last season with an in-form Cristiano Ronaldo, but their defense has been superb and unless all their players get hurt I see it very hard for anyone else to win the EPL in 2009. But that's Alex Ferguson's Achilles heel--a defense depleted by injuries against Ibrahimovic, Adriano and company. Mourinho may have a few cards up his sleeve yet. 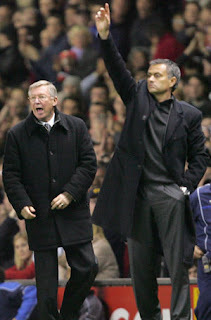 And this is where I end this discussion about the premier soccer competition... A battle between two old foes: Sir Alex Ferguson and the Special One. I pick Inter. As long as Rooney's kept busy and Ronaldo frustrated, Berbatov, Scholes, Nani and Park may be force to cut back on their attack mode. There are 180 minutes to this match. San Siro should be a fortress and Old Trafford a castle to be conquered. In a world torn between school and a timely dinner, one would not expect to find time to watch Copa Libertadores. Yet some like myself still manage. I was able to watch about 60% of today's game between reigning Libertadores champions Liga Deportiva Universitaria de Quito vs Palmeiras of Brazil as well as pieces of the Boca Juniors - Deportivo Cuenca (also from Ecuador). I got help from my DVR while at home and a little website called justin.tv that has streaming video, including sport from almost anywhere in the world. That's right, next time you feel left out because you're at work or school and only have access to a PC, never fear. No matter what system you're running (Linux, PC, Mac), it should work fine. This quick post is an homage to Ecuador futbol, which although still ailing from a bad start to qualifying when Luis Fernando Suarez was at the helm, still has club football to represent. It was Liga's turn to defend its crown in this season's Copa Libertadores. They opened their campaign against an established Brazilian side.... Palmeiras. To start, one can never count out an Argentinean or Brazilian team at any point in international club competition. That being said, however, Liga still thoroughly outclassed the Brazilian side. Don't get me wrong, Palmeiras looked good in the attack and scored two goals. But it was Liga's persistence through the play of Urrutia, Manso, Reasco and Bieler that time and time again got through the brazilian defense. The result was an exhilarating 3-2 match won by the Quito team. 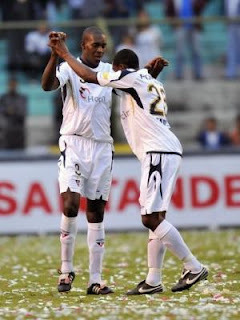 Sure, Joffre Guerron and Luis Bolanos may be gone but Calderon and Araujo make up for the losses, as does the return of the great Neicer Reasco after an unsuccessful stint at Sao Paulo. Liga's spine remains: Urrutia, Bieler, Manso, Calle, Campos, Ambrossi, and Pepe Pancho Cevallos. And what about the team that only wants the Libertadores? Boca Juniors of Argentina, that is. I heard on the radio that club officials put the continental competition as a higher priority than the domestic league. Well, when put against Ecuador's modest Deportivo Cuenca things didn't quite look right. Aside from Palacio, Riquelme never found his rhythm and Palermo was out of touch. Cuenca looked a bit lost, I must admit, but they only just lost the game by 1-0. It's still early, ladies and gents, but there's still room for the Liga faithful to dream. I will not dwell on the Becks subject anymore. Besides the "deadlines," incessant squabbling and endless rambles by bloggers like your truly, we should face the facts: the league would be losing anywhere near $30-50 million per year were Becks to be absent for the next 3 years. It's only logical to make at least some of it back (say $15 million). Remember that Becks does have an escape clause after his third season (2009) so the league better act on it now if it's going to make any money from this situation at all. Back to the point. Okay, let's say Beckham goes. AC Milan breathes a little easier (although Zlatan's Inter is probably going to take the Scudetto) and Bruce Arena can forget about the circus. What about that other marquee player "currently" in the Galaxian's ranks, Landon Donovan? Donovan is the poster child for US soccer and at just 26 he has amassed quite a resume, albeit incomplete. Last season's MLS top scorer and the leading goal scorer for the men's national team (37 and counting) has one missing piece: the pedigree of a place in a European league. Sure, he had his time with Bayer Leverkusen earlier in his career but he never quite settled into the Bavarian life and game and was shipped back to America only to blossom with the Earthquakes and then the Galaxy. I've seen the man in action and he's always dangerous for rivals. 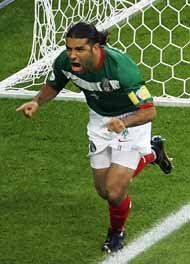 Who can forget the goal scored against Mexico in 2002? Not me, that's for sure. And yet, recently, Galaxy made more than one potentially catastrophic loan to a club in Europe--Landon Donovan to Bayern Munich. This weekend, with the loss of Luca Toni, Donovan has his best and possibly last real chance at staying in Europe. Unlike Beckham and much like other Americans abroad, he has the stigma of being from a nation other than Brazil/Argentina within this continent--that is, you better prove it within 3 weeks or you're benched, loaned out or shipped back. Granted, Juergen Klinsmann likes the guy and trained with him in California, he will still need to score in an active competition in order for the Bavarian club to offer any sort of compensation to MLS for the loss of another prodigy. Donovan is in a position where his career, MLS's image and US Soccer would benefit from a permanent move abroad. What's better than having the top scorer in US history play in a marquee league and team on European soil? Potential outcome: MLS sells both Becks and Donovan. Part of the package in a deal like this would be to get a player from Milan (Sheva?) and/or Bayern Munich as well as (pointless but highly attended) friendly games. This could also open the door for DaMarcus Beasley to come back to the States and play under Arena once again. I hope Beasley stays in Europe, however, but I prefer that he switches clubs since Glasgow Rangers aren't giving him many nods on any given week. That said, the Galaxy will be very lonely, hurt and depleted. Only a truly big signing and perhaps repatriation of a player like Beasley might douse the wildfires set ablaze this MLS off-season. Justice. Plain and simple. All day, all week, all month I've heard this and that about how Mexico was finally going to beat the US in this, the first World Cup Qualifier game of the year and of the Hexagonal. The annoyingly partisan crowd at the helm of XM Deportivo was getting to me, I admit. I almost believed that this was going the be the game the US finally lost to Mexico. I couldn't have been more wrong. Bradley (coach's son), proved why he belongs with the big boys in the German Bundesliga and why he's here to stay at midfield for US for the foreseeable future. Donovan was muted by a stingy Mexican defense but still managed to disjoint his foes on more than one occasion. Howard was superb. The US continues to be a goalie-producing machine (Meola, Keller, Friedel). In the end it also boils down to Nery Castillo's injury late in the first half and the ridiculous karate-style Rafa Marquez challenge on Howard. I argue that Jozy should have come in a bit earlier than he did and maybe Torres should have taken Kljestan's slot instead of Clark, although I see some wisdom in putting in a defensive midfielder. He could also have come in as a late sub for Dempsey or Beasley, but since the second goal came so late in the game it is understandable. Bradley's goals were opportunistic and lucky, but that's where stars and good teams shine. In the end no amount of US team voodoo dolls could do the trick for Mexican fans. Try some other witchcraft next time! Well done, yanks! Gringos still rule. GOALKEEPERS: Tim Howard, Brad Guzan; DEFENDERS: Oguchi Onyewu, Carlos Bocanegra, Frankie Hejduk, Heath Pearce, Dan Califf, Jonathan Bornstein, Marvell Wynne; MIDFIELDERS: DaMarcus Beasley, Michael Bradley, Sacha Kljestan, Clint Dempsey, Jose Francisco Torres, Ricardo Clark, Robbie Rogers; FORWARDS: Landon Donovan, Clint Dempsey, Brian Ching, Jozy Altidore, Charlie Davies. This team is not too different from the one that played the last friendly against Mexico in February of last year in Houston. Cherundolo's presence in the back will be missed but homeboy and ageless Hejduk will fit just fine playing against his home crowd at Crew Stadium. Also in, although maybe not in the final 18 are speedster Marvell Wynne, composed Dan Califf and feisty Bornstein. 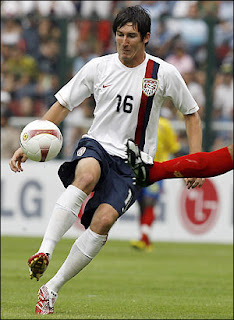 The midfield is where it gets interesting... Out is Bobby Convey to be replaced by an impressive Sacha Kljestan (hat trick versus Sweden). Freddy Adu's lack of minutes on the pitch have meant his temporary replacement by Mexican-American Jose Fransisco Torres (recently chose to play for the US instead of Mexico). This is a brilliant move by Bradley considering Torres' play with Pachuca in the national and international scene. 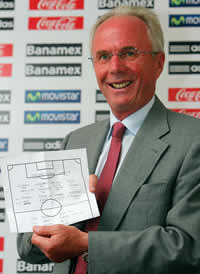 It's also great to have someone in the team understand the inner workings of the Mexican League play. Ricardo Clark is steady at midfield and does the dirty work whilst Robbie Rogers and Michael Bradley (coach's son) inject some youth into the system as well. Up front we have some of the usual suspects with Dempsey as an attacking midfielder/striker in an "enganche" position. Donovan always a must as is Brian Ching's experience. To round things out are American prodigy and recently transferred Jozy Altidore and Sweden league standout Charlie Davies. As we move closer to gametime more and more of the Spanish media in this country covers the Mexican team. Some, like XM Deportivo's Futbol de Primera program with Andres Cantor, Sammy Sadovnik, Rosa Beatriz Sanchez and Jaime Gallardo are annoyingly, understandably and poignantly on the Mexican side of the balance. Sometimes it makes me wonder... hey, Andres aren't you and Rosa and Sammy Argentinean? Well, such is the market for mainstream latin soccer in the US. It's interesting, however, to point out the scale of meaning of this match. Here in the US, to most, it's just another sports game. To us fans of the sport and of the American team this is the grand Superbowl of them all. In Mexico and to the legions of immigrants already on American soil, this is the biggest game of the year. It shouldn't strike as strange that Blockbuster in Mexico as well as a certain newspaper started circulating voodoo dolls of the US national team to inject certain doom for our players. USsoccer has outdone itself this year in various ways... first is playing in our home base of Columbus. It may not be as cold as we thought a mid-February match would be but considering both teams have players at high latitudes this shouldn't be the determining factor. Instead we have a fortress of american fans in an intimate scenario, mainly colored red, at the stadium of the current MLS Champ--Columbus Crew. As a wise man once put it: Two teams, both with head coaches, playing the game of football. This should prove to be a great game! 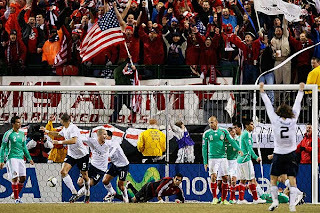 This is the first part of a multi-post series detailing what is sure to be a match worthy of world class soccer: US vs Mexico at Columbus, Ohio next Wednesday at 7PM (ESPN2HD) for world cup 2010 qualification. For those not familiar with the qualifiers this is the first game in a home and away tournament with 6 countries vying for the 3 1/2 spots to South Africa next year. Each team plays 10 games in total. The group, besides Mexico and US, includes Costa Rica, Trinidad and Tobago, El Salvador, and Honduras. Mexico is never a weak side, no matter how many Guardados or Velas are injured or suspended. Superclasicos like US-MEX always are tossups. Also, a word of caution to the overconfident... This is a Mexican side in dire need of a good result. To them a win is a must, a tie is acceptable and a loss is a catastrophe. Jaime Gallardo and XM Deportivo company have seen "el Vasco" Aguirre's dismission from Atletico Madrid as a precursor to replacing Eriksson were he to fail in Columbus. This is ridiculous to me. There are 9 other matches and of all 10 winning in the US should be, in theory, the toughest. A new crew of players is also at hand, including Vuoso, Naleson, plus some that have not been called up recently (Castillo, Franco). Some players, like Castillo, have not seen regular play in their European teams but this is also the case with US players like Pearce, Adu and Altidore. Some players to watch for are Castillo, "el venado" Medina, Omar Bravo and Matias Vuoso. Marquez, Osorio, Salcido and Galindo are a fortress in the back. 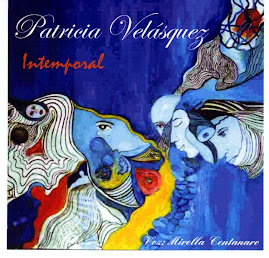 Villaluz is a potential headache, as is Pardo (the savior of Mexico these days). This is my homage to Mexico, always a disciplined, historical team with diehard fans that will make up a large portion of Crew stadium next week. Good luck, fellas, and may you have a good game.